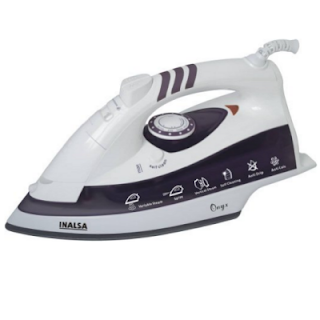 Amazon offering Inalsa Onyx 2000-Watt Steam Iron Ceramic coated Sole plate Rs. 1199 Rs. 100 cashback. Ceramic coated sole plate and anti drip and anti calc functions. Vertical ironing, powerful spray and self cleaning. Variable steam and temperature control and ISI approved. A big size complete iron with steam, spray, vertical iron, antidrip and anti calc functions. Warranty: 2 years on product. Power: 2000 watts; Operating Voltage: 220-240 volts. Includes: Steam Iron, Water Pouring Cup, Instruction Manual with Warranty Card and Customer Care List.